Cleaning is a natural home business, because it is work that can easily be scheduled around family life. Many businesses do not lend themselves as naturally to working from home as the cleaning business does. The beauty of this industry is that you can scale it as big or small as you wish, and choose the direction you’d like to take it. Do you want to clean corporate offices, industrial complexes, or restaurants? Or does a home office cleaning business appeal most? Window-cleaning is an art as well as a fine science — it also requires physical dexterity and a bit of daring. Carpet cleaning is a business that is going green in a big way. Large-scale cleaning businesses are always in demand, and with the right equipment, you can provide a necessary service and easily earn over $100,000 a year. Small-scale cleaning is an excellent way to get your feet wet as an entrepreneur. You will learn how to market your services, who to work for, where to find new business and how to keep the business you get. The cleaning business is a great home-based business to start if you want to learn every aspect of working for yourself. We started out as office cleaners because we wanted to provide for ourselves while also working in a healthy environment, giving a service that people are happy to pay for. Staying near your own home while working is a blessing and a luxury in many ways. No traffic! You can save gas and boast about having the world’s best commute. Not to mention avoid the headaches that accompany working for a high-stress corporation. The main benefit from running your cleaning business from home is the money to be earned. Many people love the idea of working from home but they just can’t pull it off because they lack guidance. Getting started on the right track is the key to success. If your goal is to make a good living cleaning, learn how to start a office cleaning business from home. Everybody needs the service you provide, so there is never a lack of available work. Working in nearby neighborhoods means more time for family. More time for transporting kids to and from activities. It means less time on the highway and more opportunities to dash to the grocery store or to keep important appointments. One valuable and non-tangible benefit of working for yourself is the ability to choose how many hours you’ll work in a day. Making your own work schedule takes discipline, but entrepreneurs deeply value the freedom earned by working for oneself. You’re a natural entrepreneur (or you wouldn’t be reading this article), so you probably value that core freedom as well. When you are in the employment of someone else, it is not possible to choose your own hours. It is not possible to change them when the kids are sick, or when life otherwise throws a curve ball. The worst stress is caused by not being able to shift something as fundamental as your schedule, when unpredictable events deem it necessary. Working for yourself in a business you run from home offers a low-stress way to provide a life of health and wealth for your family. Be there for your kids or spouse when you are needed. Work extra hours when you choose to — not when someone else demands that you do. Within the cleaning industry there are many possible paths to choose. Some take an initial investment, some not so much. If you start a residential cleaning service, or a housecleaning business you may already own some of the materials and supplies needed. Starting a cleaning business from home will not require much more storage space than a spare closet. House cleaning requires a couple of buckets and sponges, a squeegee and rags, a broom, a vacuum cleaner, and maybe a steam cleaner if you want to get fancy. 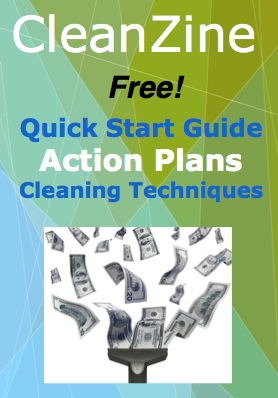 Even if you want to do residential cleaning, possibilities for financial success are great. It is possible to earn a hundred thousand dollars and even more per year in the cleaning business. The way to do this is to start off strong. When first starting your business, you’re motivated. You’re on fire! This stage is really exciting, because you see the endless possibilities of working from home and being your own boss. All of your enthusiasm will pay off. However, you have to push yourself when you're in this early stage of great possibility. Dream of gliding through work-days ahead, earning big sums of money in very little time. But take the time now to create the best business systems you can. Your motivation will carry you through. Pushing your new business through the first stage of growth can feel a little like climbing uphill. This is why it’s best to lean on a mentor or someone that will suggest goals. Achieve growth in small stages, and one day your business will be as big as you dream.